Nick loves to create in the kitchen, and is constantly thinking of new products we can introduce to you. We are excited to bring you the first-ever blend of northern Michigan cherries and an Argentinian favorite. Please give a warm welcome to our ChimiCherri™ Sauce. 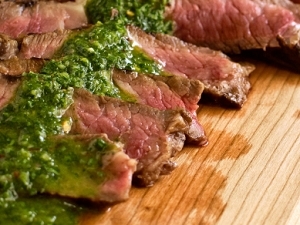 If you don't know, a chimichurri sauce is an Argentinian pesto made with chopped parsley and a fantastic blend of spices. We infused our ChimiCherri™ Sauce with tart cherry concentrate for a subtle, yet noticeable cherry tang. Chimichurri is typically used as a steak sauce, but can be used anywhere you might use a pesto.One of Nick's favorites was trying our ChimiCherri™ Sauce on a black bean burger. You could also grill it over chicken or finish a nice piece of salmon with it. Try it as a dipping sauce for bread. Use it in place of pesto on pasta. Send us a picture of how you use our ChimiCherri™ Sauce, and we will share in on our website, or perhaps in our next newsletter. Our ChimiCherri™ Sauce is created with a special blend of olive oil and soybean oil so it remains pourable after refrigeration. It is available now in a 12oz bottle in our online store. Do you still have Cherry Zing?